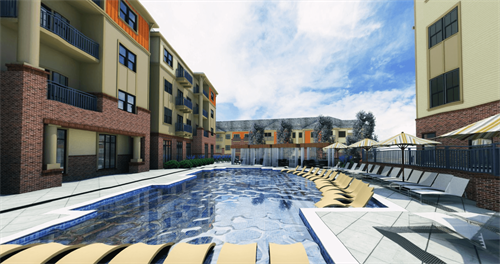 A BRAND NEW student community located right near East Carolina University. Inspired by both the student lifestyle and bohemian vibes, this community will provide the ideal environment for student culture and comfortable living. Choose from 1, 2 and 3 bedroom fully-furnished, garden-style apartments, all with private bedrooms & bathrooms. With all furniture included, you'll only need to bring your personal belongings, special sundries and the finishing touches to make your space your own. Cable, high-speed internet and all other utilities are included in your rent, so you'll only need to worry about one monthly bill. You'll enjoy the comfort of cooking old family recipes in your own kitchen, complete with faux stainless steel appliances, granite countertops, microwave and dishwasher. If you're not keen on cooking, you'll be happy to know that we're tucked in a location that's not only convenient to campus, but also several restaurants. When you're not spending time in your apartment, you'll be able to enjoy the numerous features and amenities that The Eastern has to offer. Grab a book and lounge by the resort-style pool. Accomplish your daily workout in the 24-hour, state-of-the art fitness center or find your zen in the yoga/dance studio. The possibilities are endless and the choice is yours.